Slender Man is basically a boogeyman for the internet age. Slender Man began in 2009 as an entry to a Photoshop contest on the Something Awful forums. Something Awful user Victor Surge created a pair of photographs showing a tall, thin, faceless figure in a crowd, along with the explanation that the Slender Man is a strange creature who is known to stalk children. Slender Man's legend has only grown since then. He is described as being tall (usually over 8 feet tall) with long thin matchstick legs and arms, and a blank face. He has the ability to wipe the memory of his existence from his victims, teleportation, and distortion of video recording equipment. 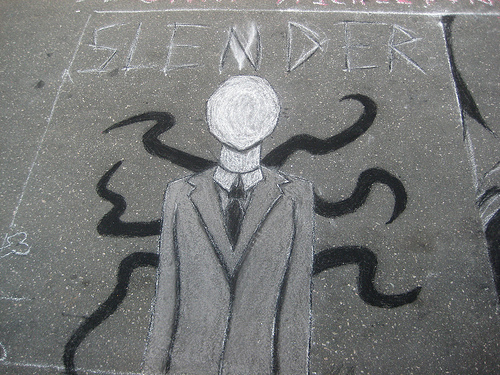 Slender Man depictions often include long black tentacles, but not always. Slender Man usually wears a black hat, and can walk across ceilings and walls. This last ability is shown to good effect in this video of the Slender Man walking across the outside of an apartment building in an unknown city. You can see how Slender Man earned his nickname, "Daddy LongLegs." Slender Man became instantly popular across the internet, particularly on the 4chan board /x/ which is dedicated to the paranormal. Slender Man fanfic, artworks, and legends abound on this board, which treats Slender Man as a sort of mascot. Slender Man works can also be found on Tumblr and Deviant Art, where Slender Man illustrations are as creepy as they are plentiful. The Slender Man myth was central to the groundbreaking YouTube series Marble Hornets, which was created by two art school students, and took the form of video diary entries. Marble Hornets became so successful that men behind it were hired by a movie studio to start work on a film, which reportedly will be released in spring, 2014. Slender Man is an interesting example of an urban legend or paranormal phenomenon where everyone is in on the joke, but it works anyway. No one believes that Slender Man is actually real. Everyone knows that he is fictional. But that doesn't stop Slender Man works from being thoroughly unsettling and scary. And who's to say that, hundreds of years from now, history will have forgotten that everyone once knew Slender Man was fictional? Perhaps Slender Man will have passed into the pantheon of paranormal and off-beat phenomena, to join the pantheon alongside ghosts, werewolves, and the Loch Ness Monster.